A curving rear tower wall might be homage to a treasure lost. Northwestern University says it's looking for community input on the three finalists in the design competition for the new biomedical research building that'll replace Bertrand Goldberg's iconic Prentice Women's Hospital, which NU is in the process of demolishing. The three architecture teams competing for the project are Goettsch Partners, Chicago, with Ballinger, Philadelphia; Adrian Smith + Gordon Gill, Chicago, with Payette, Boston; and Perkins + Will, Chicago. Click here for a look at the mostly rectilinear glass slabs they're proposing. It appears that only Perkins + Will, with a tower wall that curves on the rear, has included what might be a nod to Goldberg. The tower, however, wouldn't materialize any time soon: it would be the second phase of the project, to be built at some as-yet-unnamed date in the future. First-phase construction is set to begin the first quarter of 2015, and will take as much as four years to complete. 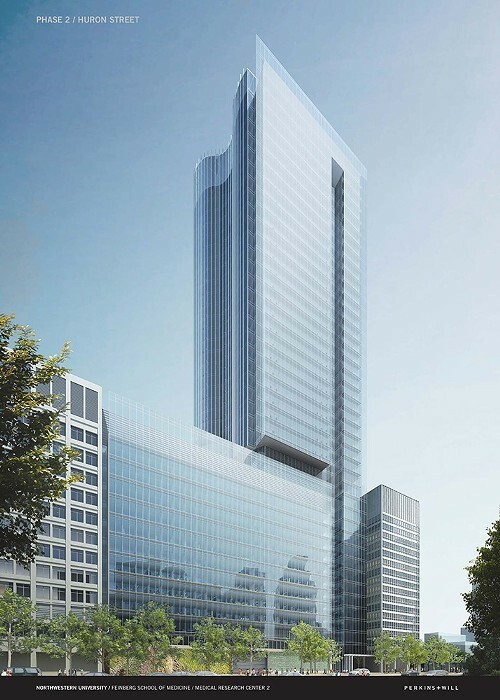 In all three plans, that phase consists of a roughly 600,000 square-foot, blocky base building that'll connect on the west side with the existing Robert H. Lurie Medical Research Center. Drawings, models, and floor plans for the three designs are on display in the lobby of the Lurie Center, 303 E. Superior, for six days, now through 11/12. As for the input: NU says comment cards are available in the research center lobby. Comments can also be e-mailed to design-competition@northwestern.edu. The university expects its board of trustees to select the winner by the end of this year. The Lurie Research Center is open 7 AM to 7 PM, Monday through Friday, and will be open during this weekend's SOAR (Streeterville Organization of Active Residents) Artisan Market: Sat 11/9, 10 AM-5 PM, and Sun 11/10, 10 AM-4 PM.